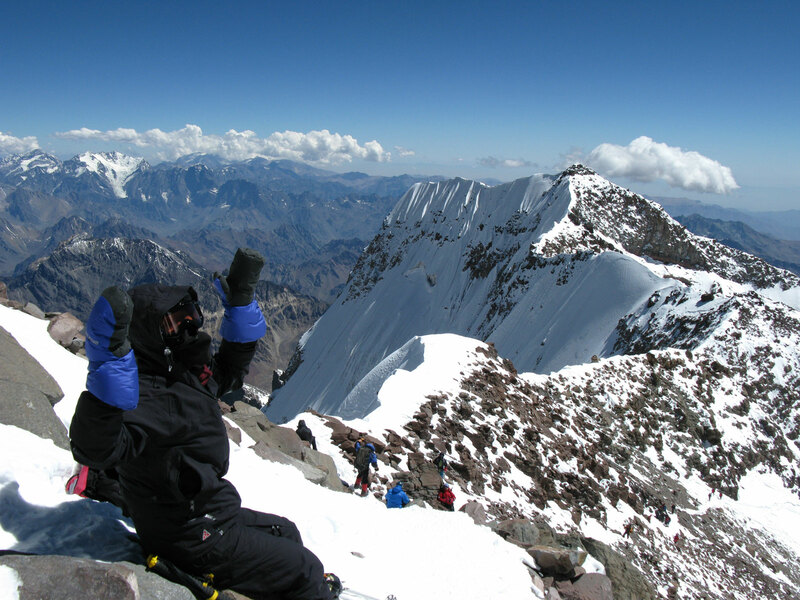 The ascent of the Aconcagua (6962m) is more than a dream for mountain climbers from all over the world. With AZIMUT 360 you can be one of the privileged ones. This ascent does not involve any technical difficulty but requires a goof fitness level and excellent acclimatization. Our catalogue roundtrip includes an ascent by the regular route, though we can also arrange a different itinerary for you. We highly recommend that you combine the present program with an acclimatization climb to Mount Plomo (5430m). Conquer the Roof of America!!! Reception at Mendoza airport (Argentina) Transfer to Hotel. Afternoon briefing with your lead guide to review itineraries and check equipment. Lunch included. We get the climbing permits Drive to Penitentes. Short afternoon walk in the nearby area. Breakfast, and dinner included. Short transfer to Horcones and walk (approx. 2-3 hours) to Confluencia where we camp (approx. 3200m). Mules for charge from Penitentes directly up to Plaza de Mulas. Breakfast, lunch and dinner included. Hike (approx. 7-9 hours) to the impressive south face of Aconcagua (Plaza Francia). Back to Confluencia Breakfast, lunch and dinner included. Hike (approx. 8-10 hours) to Plaza de Mulas base camp (approx. 4300m). Breakfast, lunch and dinner included. Acclimatization day in Plaza de Mulas base camp. (rest or day trek or minor summits to be defined on spot with the guide as preparation for Aconcagua). Breakfast, lunch and dinner included. Portage day (4-5 hr) to Camp Canada (4800m). Return to Plaza de mulas. base camp.) Breakfast, lunch and dinner included. Acclimatization day in Plaza de Mulas base camp. (Short trek to a glacier to use crampons suggested). Breakfast, lunch and dinner included. From Plaza de Mulas, we walk up to camp at Plaza Canada. (3-4hr). Breakfast, lunch and dinner included. Rest day with possibility to carry some food or personal gear to Cólera and return to camp. Breakfast, lunch and dinner included. Rest day with possibility to carry some food or personal gear to Cólera and return to camp. Breakfast and lunch and included. Summit day. Back to camp Colera. Breakfast and lunch included. Security day in Plaza de Mulas base camp. (Possible 2nd summit attempt). Breakfast, lunch and dinner. Transfer to Mendoza airport. Breakfast included.